The giraffe’s range encompasses pastoralist northern Kenya, an area divided into a jigsaw of private and group ranches, agriculture, and protected areas. The continued long-term successful conservation of wildlife and biodiversity in northern Kenya depends upon the diverse people in the region developing and maintaining a conservation ethic that leads to community coalitions for collective and sustainable management of natural resources. San Diego Zoo Global curators have guided and supported the establishment and management of community conservancies, including West Gate Community Conservancy and Ishaqbini Community Conservancy, as well as the Northern Rangelands Trust, which coordinates the 3.1 million hectare aggregate of conservancies. These spaces are vital for the continued existence not only of reticulated giraffe, but also Grevy’s zebra, hirola (a type of antelope), painted dogs, savanna elephants, black rhinos, lions, cheetahs, and others. 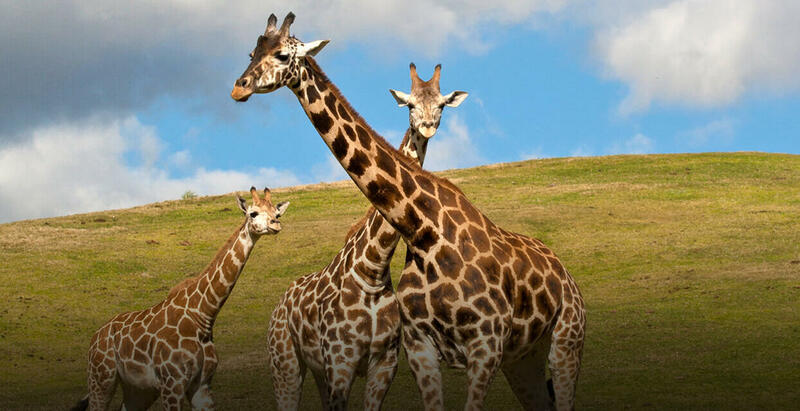 To date, the Genome10K Project has sequenced more than 200 vertebrate genomes, and is completing sequencing of the giraffe - which is in serious population decline - using samples from our Frozen Zoo®. Information encoded in the genomes of threatened and endangered species revealed by the Genome10K project will be instrumental to conservation efforts, contributing new information on life history, genetic disease and disease risk factors, and population history. This information will significantly increase our understanding of how to sustainably manage reticulated giraffe populations. Our Global Partnerships and Community Engagement teams are working with our partners to develop a socio-ecological research project in northern Kenya that examines giraffe population levels, movements, and ecology, as well as traditional ecological knowledge, attitudes, beliefs, and behaviors of local herders living alongside giraffe. Our interdisciplinary approach will result in community-based conservation interventions, including community outreach and education programs. With just a click, schools help save giraffe in Kenya!